We humbly ask for your vote..
As some of you may know, Maria and I have an Etsy shop where we sell her hand tie dyed sewing projects and my hand forged knives and other metal work. Etsy is having a contest this month to give away $10,000 to the shop that gets the most votes. The money is designated for small business improvement and we could step up our business greatly with a prize like that. It doesn’t cost a thing to vote. You can vote for as many shops as you like, but only one vote per shop. So, as the title of this post says, we are humbly asking for your vote. If you decide to help our cause and would be willing to share the link in a repost blog or any other type of social media we would be truly grateful. Thank you for reading a nd following our blog. We are thankful for each and everyone of you. 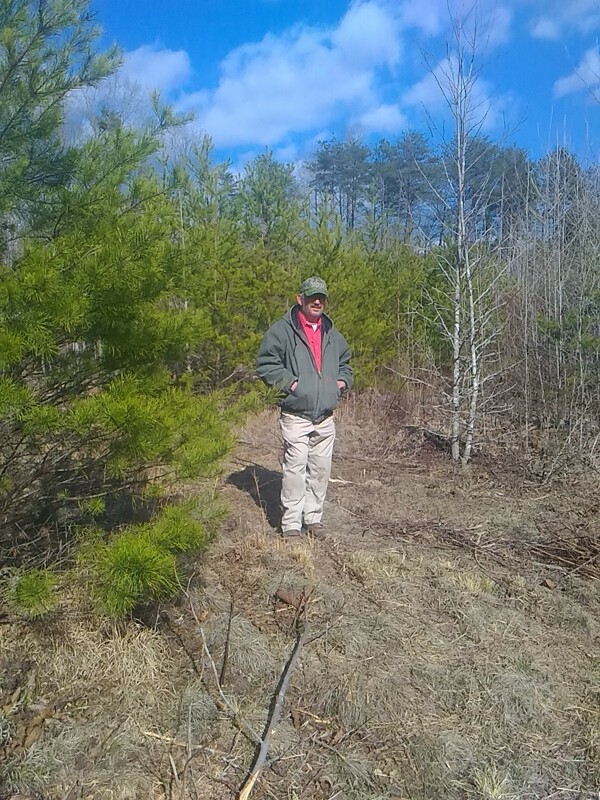 We all know that the greatest asset to a homestead is community. And this community is a true blessing. 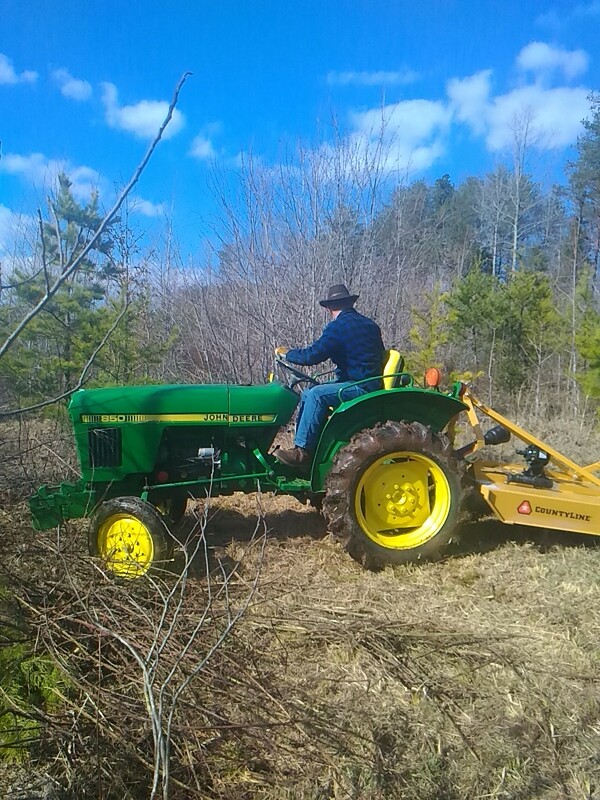 The old girl is working well..
We finally got our old tractor up to the farm. I had confidence in her abilities, but had no idea that she would work as well as she does. In about an hour I was able to clear as much as it took us in 4 other visits. She was running strong, and with the brand new bush hog deck from County Line products she was eating brush like mad. We had a friend help us haul her up there and I felt bad for him because it was a 3.5 hour drive up and there wasn’t really anything for him to do while Maria and I did our normal clearing activities. We didn’t stay that long to work that day because TJ (the friend) needed to get back to work the next day. I did want to cut a little more but I unfortunately hit a pretty solid stump hiding in the brush and the shear pin on the pto shaft did what a shear pin is supposed to do. It sheared. Since we hadn’t brought our own truck with us, we didn’t have any spares meaning we were done for the day. Notice the end of the pto shaft? Tj being a trooper. He’s a great friend and really helped us out. So, we are going back this weekend with a pocketbook of shear bolts and really put the old girl through her paces. We hope that everyone has a wonderful weekend! A little pre-work snow fun.. I know A lot of folks got some snow over the weekend and there are a ton more in the northeast that are going to get a blizzard in the next couple of days. Maria laughed about the snow we got. We found it funny for a couple of reasons. One of them is that since is from Maine and I’m from Indiana this little dusting wasn’t really a concern as it seemed to others around here. 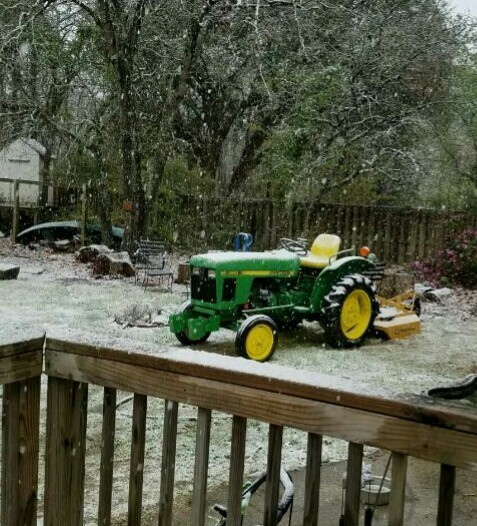 The southeastern coast of North Carolina doesn’t get much snow at all so people have a tendency to freak out. The other reason we found it humorous was that the local weather man was pretty adamant that we would only get some rain…not an inch of snow. So, we had a little snow ball fight where I inadvertently whitewashed Maria on the side of her head when a snowball hit the side of the house as she tried to duck. She wasn’t mad because like I said, she’s from Maine and knows the rules and risks of the snowball battle. I sure do love that woman! I have known that for quite a long time, but when she came home for lunch the other day, still dressed really nice in the dress that she decided on that day and walked through the back gate to where I was working in the forge. The reason I realized how much I love her is that as nicely as she was dressed, she came through that gate toting the two new front tires for the tractor that FedEx had dropped on the front porch. She is the best ever!!!! We hope that everyone has a great day and be sure to let the ones you love know what they mean to you. In our last post I told you all about our new tractor. 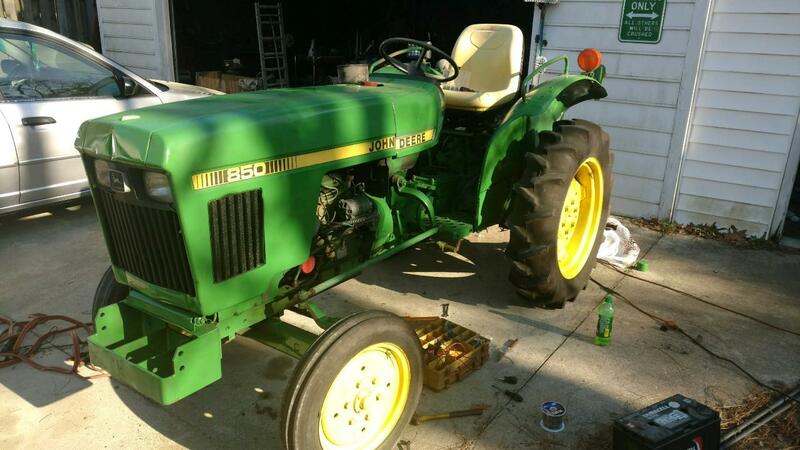 We’ve got a little update on getting it ready for the farm. 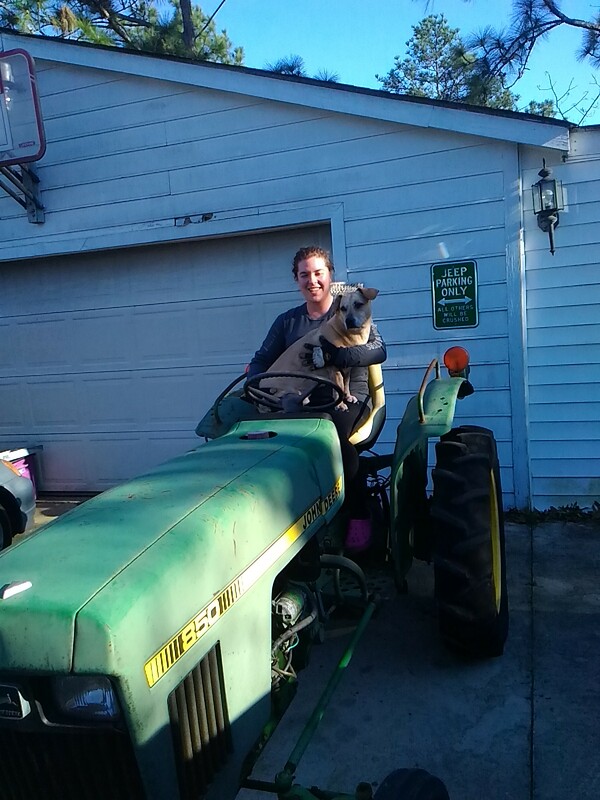 Maria initially named her Debbie, but since we know someone named Debbie it was a little weird talking about her so we renamed her Darla (the tractor, not the friend lol) Deere. We are still waiting on a couple of parts, the starter and muffler, but I got a lot done today. I removed and repainted a bunch of panels and brackets. I fixed and rewelded the linkage for the throttle. I installed a work light to the fender and wired it up. The battery cables needed a little love so they now look a lot better. We took a ride to Tractor Supply today and drooled over the three point implements that are available. And then we picked up a few things for Darla. Some new locking pins, a towing shackle, a new top link for the three point hitch, and some cans of paint for her rattle can therapy. The paint alone has her looking like she’s ready for the county fair. We have to borrow a trailer to get her up to the farm, so once we do we’ll have some photos of Darla in action. We hope everyone has a great week. Today we had a new member join our family. We had been contemplating buying a tractor as we are going to need one eventually on our 18 acres. 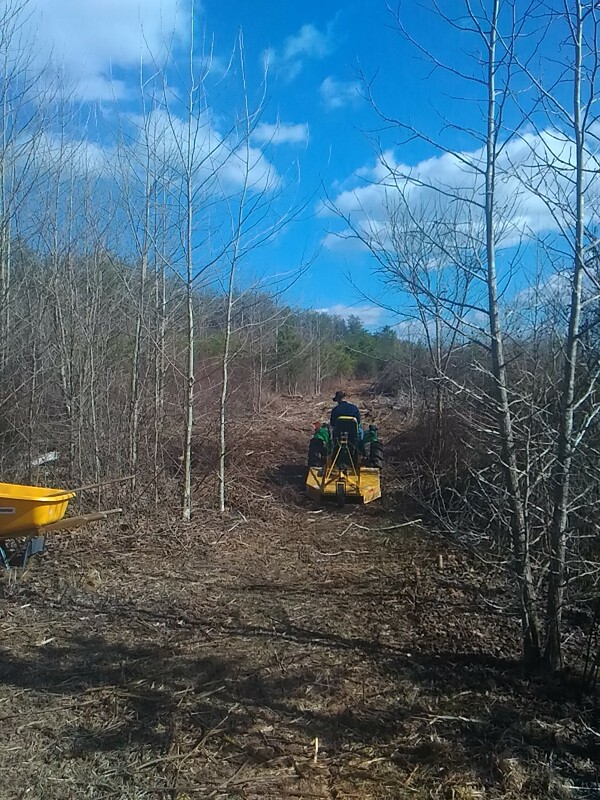 With so much brush to clear between the trees we thought about buying a billy goat brush cutter, but once the brush is cut there won’t be much use for that. So, we came across a great deal on this little beauty. 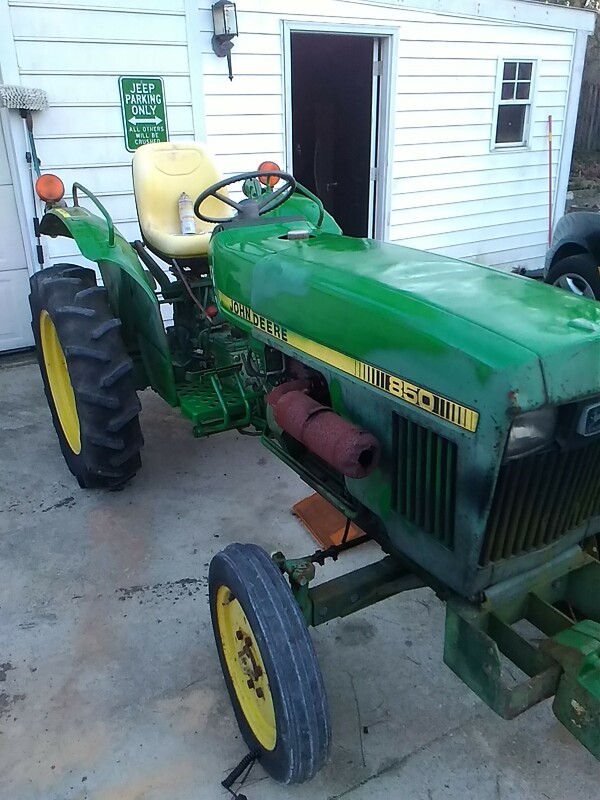 Its a 1985 John Deere model 850. 25 HP two wheel drive with a three point hitch. It needs a little love, but since I was a diesel mechanic in the Marines I can handle anything that comes up. It needs a new starter (current one works but is a bit wonky), a new muffler (rusted out), and two new front tires (a little dry for). Other than it starts and purrs like a kitten. We started touching up the faded paint just for fun and because I still had a can of JD green spray paint in the shop.